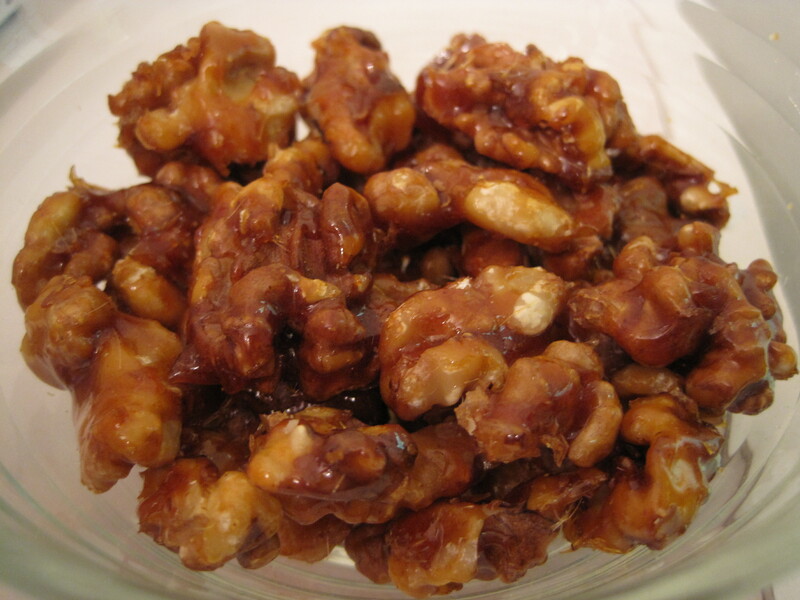 I started making my own candied walnuts when I started making waldorf salads (recipe here). These are fantastic snacks, especially while watching a movie or a game. And if you put them into clear gift bags tied with pretty ribbon, you can sell them at bake sales or use them as cute favours for dinner parties, showers, or gifts over the holidays. In a medium saucepan, cook the sugar over medium heat. Start stirring only when the sugar is at least half melted and is starting to turn gold. Keep stirring until all of the sugar is melted and the colour is a medium amber. Then add the nuts to the sugar while stirring to coat each nut. Then spread the nuts in a single layer on a silpat (silicone) mat lined baking sheet. Try to separate the nuts with two forks before they cool completely. Sprinkle with salt and let cool completely. Store in an airtight container at room temperature. I love this idea. I am definitely going to make these for people at Christmas. I’m so glad you like it 🙂 You could also sprinkle a pinch of cayenne powder at the end for a different variation if your friends like spicy food. I tried out this recipe this past weekend and they were a big hit. The only thing is that its a pain to clean the pot – I found you had to use boiling hot water to melt the sugar so you could scrub the pot clean. Thanks so much for your comment, Shadi 🙂 I’m glad they turned out for you. Regarding the clean up, I use a heavy bottomed stainless steel sauce pot. I soak it in hot water for a few hours and then the sugar comes off relatively easily for me. Let me know if that works for you.